In 2016, LG has made a special effort to distinguish itself from its competitors. After launching its first modular smartphone in March, the G5, the South Korean manufacturer is back this Fall with a unique phablet. The LG V20, with its dual screen and removable battery certainly stands apart from the current crowd of smartphones. But, does it deserve to be counted among the best smartphones of the moment? The answer is in our review. LG’s new flagship device was officially launched on 6 September 2016 in San Francisco. It has been available in the US since November 8, at a price of $799 (for 32 GB), in three colors: Titan (dark grey), Silver, and Pink. A 64 GB version is also available. At the moment, there is no information on whether a release is on the cards for either the UK or Europe. LG is considering a launch on the European market but nothing has been set in stone. The LG V20 has launched in India as of December 6 with a price of INR 54,999 ($800 USD). The smartphone is a beautiful successor to the LG V10, and its design has evolved to look more like the LG G5. However, the V20 remains an atypical smartphone. It might not be the most elegant device, but it is original. At a time when many manufacturers are just copying designs, LG has chosen to swim against the tide with the V20. Forget the polycarbonate back on the V10; the LG V20 is metal. This does not mean the smartphone is more fragile, as it has still managed to get a MIL-STD 810G military certification. The shell uses a mix of aluminum and a new silicon-based material, whilst the upper and lower parts are made of polycarbonate. I regret to say though that it lacks IP67 and IP68 certification, which is now standard for many flagship smartphones. Despite it being a phablet, the V20 is relatively compact, measuring in at 159.7 x 78.1 x 7.6 mm. The edges of the screen are quite fine and the empty space on the angles above and below the screen are quite thin. The headphone jack is located at the bottom of the phone, along with the USB Type-C port and the mono speaker. At the top is the infrared transmitter (thanks LG!) and the microphone which picks up audio at 48 kHz. The volume buttons are located on the left side of the phone. The buttons for releasing the removable back of the phone for the battery, the SIM and microSD card access is located on the right. The dual rear camera on the back does protrude from the surface but the V20 can still be laid flat on a table without wobbling. Like Sony, LG has combined the sleep button with the fingerprint reader. The similarities stop here as, unlike the Japanese manufacturer, the V20's button is located on the back of the phone. The button layout has been designed well, so even those with small hands will have easy access. Using the phone with one hand remains difficult. Using the phone with one hand is still quite difficult, despite the additional software support from LG. During our test, the sensor responded fairly well but there were some occasions where at least several attempts were needed before the fingerprint was recognized. Overall, the LG V20 is a large, attractive smartphone that has a unique personality. LG has made some progress on making the phone more attractive but the adjustments are still not perfect. The gaps where different parts of the phone come together are still visible to the eye and noticeable in its handling. 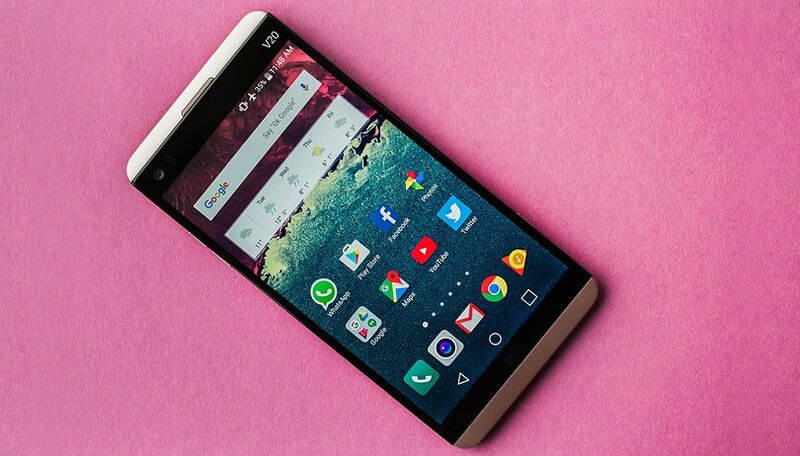 The LG V20 offers a high definition (1440 x 1560 px) 5.7 inch IPS LCD screen, with a pixel density of 513 ppi. The screen is covered by Gorilla Glass 4 instead of Gorilla Glass 5. Why have they gone with this choice? LG has declined to explain so its anyone's guess really, but as the phone has the MIL-STD 810G military certification, this is not a serious problem. For my test, the LG V20’s screen seems to be on par with other high-end phones released in the later half of 2016. The viewing angles are good, preserving contrast and visibility even when outdoors. In general, white appears to be bluish, but blacks are visibly deep for an LCD screen. When the screen is too bluish, there is a color correction mode to present a more yellow tone. Like its predecessor, the presence of a second screen is a key feature. Located just above the 5.7 inch HD main screen is the secondary 2.1 inch screen with a crisp definition (160 x 140 px) that, according to LG, is brighter than the V10. The second screen is useful for direct access to commonly used apps like the phone, calculator, messages, or your latest notifications. You can also set a signature and fully personalize the phone. Personally, I find that this is not really necessary, but this function is sure to attract a few fans. LG also offers the option to program the screen to turn on or off at specified times. The second screen stays on by default whenever your main screen is off. At first I was a little underwhelmed by the second screen, seeing it as just a pretty gadget without much purpose. After using it for a while though, I did start to appreciate it a little more. It’s certainly not a necessary feature but it does add to the overall user experience. For example, you can see notifications while still watching a video. That said, the location does not help when handling the phone as you have to contort your fingers to unlock the phone. I found it was convenient to be able to see the time without turning on the main screen but this is certainly not essential - a bit like the Galaxy Note S Pen. The LG V20 has a MIL-STD 810G military certification. This is a standard set by the U.S. Army Test and Evaluation Command. Theoretically, the V20 should be able to withstand being dropped from about 4 feet. I haven’t tried this, largely because I didn’t want to risk disappointment. Apart from the Pixel and the Pixel XL, the LG V20 is the first smartphone to be sold with Android Nougat. This means that you'll get all the features of the latest version of Android, with the exception of the System UI Tuner and the customizable quick settings. There is also a default multi-window view mode, which is very useful when combined with the V20’s second screen. Many applications (but not all of them) can operate in split-screen mode regardless of whether you’re holding the phone horizontally or vertically. You should note though that the split screen between two apps can only be achieved in landscape orientation. Some apps, such as Chrome, are better than others in this mode. You should also note that in the developer options, you can force Android to activate split screen mode for all applications but it’s not guaranteed that they will work properly. During my review, I received the latest Android security update, which shows just how quickly LG rolls out updates for their devices. Unlike many of their competitors, the South Korean manufacturer seems to fully understand the importance of keeping software up to date. It is safe to bet that the phablet will receive the Android O update when it becomes available next year. A final word about the LG UI: the V20 strongly resembles the G5. The interface is tidy and colorful. The application tray isn’t present by default but you can enable it in the home screen settings. There are also other themes available if the default option doesn’t appeal to you. The navigation is fluid as it is identical to system found on the LG G5. Under the hood, the LG V20 has many of the same characteristics found on most other high-end smartphones released in 2016. This includes the famous Snapdragon 820 processor with an Adreno 530 graphics chip and 4GB of RAM. The main difference between the V20 and its predecessor lies with the processor, which is an upgrade from Snapdragon 808. The LG V20 is fast and reliable, with performance that will not disappoint. The review results are in line with what can be expected from a device with a Snapdragon 820 processor. The LG V20 is fast and reliable, with performance that will not disappoint. Whilst it isn’t the best performing phone of its generation, it certainly isn’t the worst. Apps open quickly and multi-tasking can be done without any issues. It is a little better on this front than the Sony Xperia XZ. The LG V20 showed no weakness or signs of slowing down when faced with relentless gaming. I was able to go full out on Asphalt 8 with relative ease. The V20 also offers 32 and 64 GB of internal memory, which can be expanded up to 256GB with a microSD card. The LG V20 has a mono speaker on its underside. There’s nothing miraculous about the audio quality of the speaker. There is some bass present and at high volumes there is a slightly metallic sound. However, it is better than most of its competition and that’s enough for most users. Stereo speakers would have made for a true multimedia experience, which is something that would have been expected of a phone with such a large screen. Not everyone uses Bluetooth speakers. The real audio experience comes from inside the smartphone. Even so, music lovers should consider this phone for another reason: the real audio experience comes from inside the smartphone. The V20 has a 32-bit Hi-Fi Quad DAC ES9218 Sabre component from ESS Technology. To get into specifics, there are four DACs connected in parallel to offer a dynamic range of 124dB and a total harmonic distortion plus noise (THD+N) of -112dB. The result not only improves sound quality but also offers the possibility to natively support lossless compression formats like FLAC, DSD, AIFF, and ALAC - in theory. In practice, I didn’t notice much difference when listening but the result does largely depend on the quality of your headphones. With high-end headphones, the result should be obvious. Fortunately, LG took their commitment to sound quality a step further with the V20 by giving it three microphones to record “studio quality” 24-bit FLAC audio. The studio mode also gives you the ability to manually control all the recording parameters. The result is fantastic and this is is definitely the best smartphone for people who make audio recordings. Even in noisy environments it still performs well. As with all its flagships, LG attaches great importance to the quality of its cameras. The V20 features the same dual camera system that was launched in April last year in the G5. On the back, there are two lenses: one with 16 megapixels and an aperture of f/1.8 for low light photos and the other for capturing wide-angle photos (1/4 inch) with 8 megapixels and an aperture of f/2.4. This means you have an angle of 135 degrees to work with. This is very useful for everyday situations, as you will be able to take pictures no other smartphone can capture thanks to this wide angle. The quality, however, is somewhat downgraded as a result, and there is a rounded “fish-eye” effect at the edges. The front camera also has the wide angle feature, including an option to switch from 83 to 120 degrees, but it can only capture 5 megapixel photos. The 120 degree angle on the front camera is perfect for taking selfies with several friends in the shot. Switching between normal and wide angle format is also very simple in the camera app. As the camera configuration is identical to that of the G5, the user experience with the V20 is good, though there are some problems in managing exposure. Optical stabilization helps it achieve better results but it’s a bit disappointing when shooting video. I suggest you use the camera's manual mode when taking photos. The manual mode makes it possible to control a variety of parameters including: focus, ISO, shutter speed, exposure and white balance. While the automatic mode isn’t bad, the colors are a bit over-saturated in my opinion. When shooting in low light, the V20 performs quite well but it overdoes the noise reduction sometimes. If you are using the wide angle camera, images can appear too warm or cold. The Google Pixel or the Samsung Galaxy S7 generally do better in this area. On the video side, it shoots in 1080p or 4K. Interestingly enough, you can set the microphones to record audio from a certain direction for better sound. Finally, I wanted to comment on the glass covering the camera lenses. Several users have reported it cracking but this did not happen in my case. The LG V20’s battery isn’t the best for a phablet, with a 3200 mAh battery that is just 400 mAh better than the G5. Though it does have a big advantage: unlike the G5, it can be removed and is easy to change. All you need to do is press the button on the right of the phone to open the cover. So, how does the LG V20 stand up to everyday use? Well, it’s on the low side of average, especially for a phablet. It’s not the longest lasting smartphone. With normal use, you’ll be able to get through the day without having to plug it in, but that’s a far cry from Motorola's Moto Z, which can last up to two days. Using PCMark to benchmark the battery’s performance, it got a rather poor score of 4 hours and 3 minutes with full screen brightness and intense phone use. That’s almost an hour less than the Pixel. Note that PCMark simulates typical daily usage and measures the time that passes between when the battery goes from 80 to 20%. Finally, the LG V20 doesn’t have wireless charging capabilities but it supports Quick Charge 3.0. The LG V20 isn’t the perfect smartphone. Neither is it the prettiest nor the longest lasting. It has several shortcomings most notably, it lacks Snapdragon 821, it’s not waterproof, it isn't as polished as its competition and it has an IPS rather than an AMOLED screen. But, that’s not to say it can’t stand up to its competition. The V20 has something they don’t: it dares to be original without being eccentric. The V20 has a lot to offer users who have been scared away from the Galaxy Note 7. The V20 is an upgrade from the G5. In addition to having a real personality (thanks to the second screen) and a look that won’t go unnoticed, it does offer the best audio experience on the market. For those who don’t prioritize sound quality, the smartphone also offers amazing picture quality, a removable battery and expandable memory. In short, the V20 has a lot to offer users who were scared away from the Galaxy Note 7. Throw in Android 7.0 Nougat and you can really see the appeal. Pretty cool article, but waterproofing doesn't mean nothing to me, and as for the camera? I don't think that the camera is lackluster at all! For one, LG never said that the camera was the best in in the smartphone market in point and shoot category! It said that it was the best for content creators, how many content creators do you know the shoot in easy mode? Most of them will dial in and make sure that the exposure is correct before shooting, so i don't understand why people keep saying that about the V20. It has a wonderful camera for the manual user's experience. Some of us don't want everything dumbed down, some of us prefer to create and manually control our shot! Stop trying to make every phone for everyone, LG states who would benefit from the V20 and yet some people want it to be a Apple iPhone or a Samsung galaxy and its not! That's what makes the LG V20 so special, that it's only trying to be its self and that's refreshing in a sea of sameness.